Solar Space heat assist.. aka SHA. 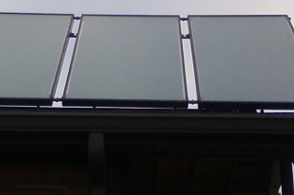 - Add a small pump, heatexchanger and loop from your new solar storage tank into your furnace. The 180 degree water in the tank is pumped through a small heat exchanger much like the radiator on your car inside your furnace. When air passes through it, it is heated and returned to your house. Less gas is consumed since the thermostat set point is reached more quickly. Alternatively, a second thermostat can be added to control the solar vs the gas heat, and they are set 2 degrees apart to avoid ANY gas being used until the solar heat is tapped for the night, awaiting the sunrise the next day and keeping the house warm by kicking in gas until then. Installed by a professional HVAC contractor and our qualified and experienced Solar Contractors working as a team to save you money and use less fossil fuels.